A proud hill station in the state of West Bengal, Darjeeling is a year-round travel destination, courtesy of its cool and pleasant climate. Internationally famed for black tea, Darjeeling is a tourist favourite because of its colonial heritage, scenic and misty mountains, and sprawling tea plantations. The title ‘Queen of the Hills’ is more than justified by Darjeeling’s beautiful trails, foggy-covered mountains, and hilly tea plantations. Taking a ride around the mountains via the globally renowned Darjeeling Himalayan Railway will make you fall even more in love with this serene and refreshing hill station. As it is well-connected with the rest of the country, you can visit Darjeeling easily. Though Bagdogra Airport is just 96 km away from Darjeeling, it is recommended that you take a train instead to enjoy the beauty of this hill station. The ideal time to visit Darjeeling is between April and June as the maximum temperature is around 25 degrees Celsius during this period. If you are a fan of rain, you can visit Darjeeling during the monsoon season in September. You will enjoy the rain-drenched flora and fauna. Don’t worry about accommodation either. Consider opting for a tried and tested hotel like Darjeeling-KhushAlaya, a Sterling Holidays Resort. Located between Old Monastery Road and Ghoom station, Khush Alya is one of the best Darjeeling resorts and houses all the modern amenities needed to enhance your stay in this tranquil place. It’s one thing to watch the sun rising in a city from the roof of a tall building and another thing entirely to witness dawn break over a stellar trail in the Himalayan mountains. Darjeeling gives you a golden opportunity to enjoy a breathtaking sunrise view of peak Kanchenjunga from Tiger Hill, located 11 km away from the city. This hill will give you an invaluable panoramic view of Mt. Everest and Mt. Kangchenjunga together. Embellished with the massive, five snow-capped peaks, this morning view is a sight to behold. You can easily rent a jeep and drive to Tiger Hill to catch a glimpse of this awe-inspiring sight. Take in the picturesque sights of this hill station by taking a ride on the Darjeeling Himalayan Railway. The train will take you through all the wonders Darjeeling has to offer, especially Batasia Loop, which is a spiral railway loop created to lower the gradient of ascent of the coach. The fact that the railway track spirals around itself is an attraction in itself. 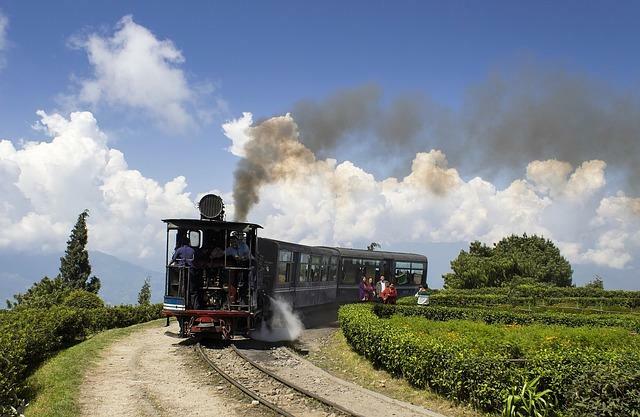 Popularly referred to as the ‘Toy Train’, the Darjeeling Himalayan Railway is a UNESCO World Heritage Site. From exquisite tea gardens to serene mountain slopes, this ride is the perfect to sample the delights of Darjeeling. Get a closer look at the local wildlife at the Padmaja Naidu Himalayan Zoological Park. Established in 1958 to study and preserve Himalayan fauna, the park is known for being one of India’s top zoological parks. It houses rare species like Himalayan bears, clouded leopards, red pandas, and Tibetan wolves. The zoo is also a home to world’s largest captive population of snow leopards. A pleasant 20-minute downhill walk from Chowrasta, this zoological park is worth a visit.